On Friday (10 April), Germany’s minimum wage will reach its 100th day, since taking effect at the start of this year. But two weeks before a meeting of coalition leaders, a new dispute has arisen among the ruling parties over corrections to the measure. EURACTIV Germany reports. Because of lower wages in other EU states, Labour Minister Andrea Nahles called for clarification that applicable minimum wage law should be taken from the country where work is performed. “We have realised this basic principle and now the French have followed suit,” she said. This principle should become enforceable at the European level, Nahles emphasised. “If we depart from this basic principle, we will have created a large loophole for circumventing the minimum wage in Germany,” she warned. In Nahles’ view, the minimum wage has been a success. “We are strengthening the income of the working population. Around 50,000 people do not have to supplement their living with the Hartz IV [unemployment benefit],” the Labour Minister explained in Berlin. A considerably large majority of Germans (86%) does think it was right for the government to introduce a legal minimum wage. This was revealed by an infratest dimap poll conducted on behalf of the Confederation of German Trade Unions (DGB) in March. According to the survey, there is also a majority in favour of the legal wage floor among supporters for every one of the political parties. As many as one in four (79%) supporters of the centre-right Christian Democratic Union (CDU) and its Bavarian sister the Christian Social Union (CSU) support the measure, the poll showed. Almost all European states already have a minimum wage of their own. In Germany, the law took effect in conjunction with a regulation on strengthening free collective bargaining. On 10 April, it will have been effective for 100 days. The nationwide minimum wage of €8.50 amounts to about 52% of the country’s median hourly wage. As a result, Germany is below the lowest wage permitted in France, Belgium and the Netherlands. 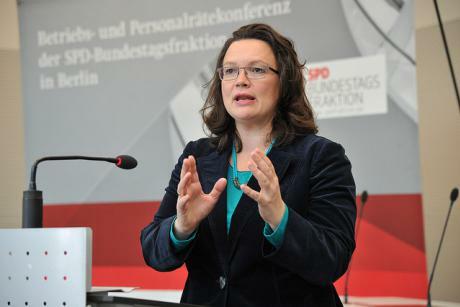 During a visit to several companies, Nahles rejected demands, most notably from the centre-right, for far-reaching changes to the recordkeeping requirement on the minimum wage in small business, for example. A coalition committee is expected to discuss the measure on 23 April. The centre-right parties, Chancellor Merkel’s Christian Democrats, and Bavaria’s Christian Social Union, are insisting that corrections be made to the recordkeeping requirment. It concerns small businesses and mini-job (low paid, temporary employment) laborers, but also the CDU’s calls for lowering the income threshold of €2,958 per month, for which proof of payment is required. Bavarian Labour Minister Emilia Müller (CSU) also called for removing documentation requirements for mini jobbers, along with employer liability for subcontractors. CDU Bundestag MP Peter Weiß and Jutta Eckenbach from the worker’s wing of the centre-right seemed optimistic that the coalition committee would lower the income threshold for recordkeeping requirements. Meanwhile, Green Party labour expert Brigitte Pothmer criticised the “unspeakable campaign” against the timekeeping requirement laid down in the law. The centre-right and industry associations are trying to point a gun at the minimum wage under the pretext of cutting red tape, the Bundestag MP told the Neue Osnabrücker Zeitung. But a minimum wage that cannot be monitored is worthless, she said. “None of the horror scenarios predicted by the minimum wage’s opponents have occurred. On the contrary, the legal minimum wage is having a positive effect on the economy. It is already a success story,” said the federal chairman of the construction worker’s union IG BAU, Robert Feiger. He is also a member of the so-called minimum wage commission. As of 30 June 2016, the level of the existing minimum wage will be evaluated for the first time. After this procedure, unions and employers in the minimum wage commission will discuss how high the wage floor should be from 1 January 2017. On 1 January 2015, Germany introduced a general minimum gross salary of €8.50 per hour. The wage floor will be readjusted yearly, starting in 2018. A minimum wage committee consisting of employer and employee representatives will decide on the adjustments made. Researchers will advise the committee. The German government can make the adjustment binding by regulation for all employers and workers. Almost all EU member states - 21 of the 28 - have a legal minimum wage covering all sectors. The exceptions - besides Germany for the time being - are Denmark, Finland, Italy, Austria, Sweden and Cyprus.